ExSim-Max for Microsoft 70-414 exam simulation software covers all of the concepts you need to know to pass the Implementing an Advanced Server Infrastructure (70-414) exam. This 70-414 exam simulation software includes well-written, technically accurate questions and answers which are divided into three individual practice exams. These practice exams simulate the difficulty and variety of question types on the real exam so closely that, if you can pass our ExSim-Max for Microsoft 70-414 exam simulations, you will know that you are ready for the real exam - guaranteed. Download the BEE and try the practice exam demo to see how ExSim-Max can help you pass the 70-414 exam. The Implementing an Advanced Server Infrastructure (70-414) exam counts credit towards the MCSE certification. 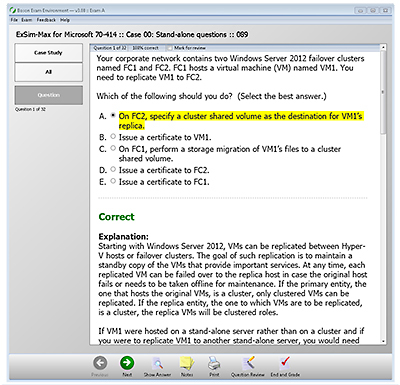 This exam is part two of a series of two exams that test the skills and knowledge necessary to design, implement, and maintain a Windows Server 2012 infrastructure in an enterprise scaled, highly virtualized environment. Passing the Microsoft 70-414 certification exam validates a candidate’s ability to the plan, configure, and manage the Windows Server 2012 services, such as identity and access, high availability, and the server infrastructure. Passing this exam along with the other exam confirms that a candidate has the skills and knowledge necessary for designing, deploying, and maintaining services and infrastructure in a Windows Server 2012 environment.